Stepping up to take charge of the Duke of Connaught’s Own British Columbia Regiment, India native Lieutenant Colonel Harjit Singh Sajjan is the first Sikh in the Canadian Army’s history to take such a command. Sikhism has a following of over 20 million worldwide and is ranked as the world’s fifth largest religion. It preaches a message of devotion and remembrance of Akal Murat the Eternal Being at all times, truthful living, equality of mankind and denounces superstitions and blind rituals. Established in 1883, the regiment is said to be the oldest military unit in Vancouver and has received 40 battle honors in its history. It has been part of the Royal Canadian Armoured Corps since 1942. In a ceremony thick with history, the change of command took place at the Beatty Street Armoury in Vancouver. A veteran of Canada’s peacekeeping force sent to Bosnia-Herzegovina, Singh has been deployed three times to Afghanistan, serving with NATO forces. Singh joined the regiment as a trooper in 1989 and two years later received his commission as a lieutenant. He was promoted to captain in 1995 and to Major in 2005. .
Singh was born in Punjab, India, and moved to Canada with his parents at the age of five . 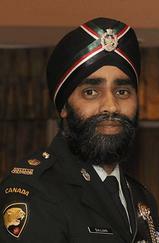 Prior to joining army, Singh served 11 years with the Vancouver Police Department.